On Saturday, I volunteered for Loyola’s Urban Agriculture Program at the greenhouse in the Institute of Environmental Sustainability (IES). The program promotes developing sustainable local food systems. 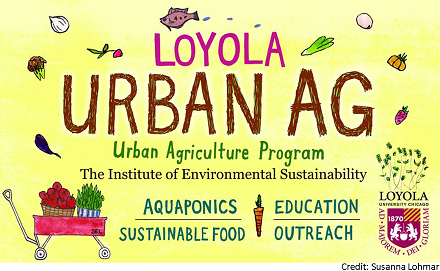 It aims to educate Loyola students and faculty, supply products for the various local food-related programs and organizations, as well as engage community members in the urban agriculture project. Though the Greenhouse Lab is not certified organic, it adheres to organic procedures in order to promote a less toxic environment for all living things. While working, preparing and cleaning two boxfuls of harvested lettuce from the aquaponic system, all or which was to be donated to a local food organization, a couple of us volunteers discussed the difficulty for college students to live by organic and sustainable eating lifestyle. It is more cost friendly for us to buy groceries at Aldi’s rather than Whole Foods or Trader Joes. Accessibility seems to pose one of the most prominent problems with regard to urban agriculture. In 2014, volunteers, comprised 14 student employees and 300 student volunteers, managed the greenhouse, two aquaponic systems, and three gardens around campus, which are Winthrop Garden, Mertz Terrace Garden, and Quinlan Rooftop Garden. Though the Quinlan garden requires special access, I highly encourage everyone to visit it. Not only does it have an amazing view of the lake, the southern part of campus, and the rest of the neighborhood, it is quiet hideout, great for breaking away from the bustling city. Just a five minute commute will make you feel relaxed in the serenity of Mother Nature at her best. With just a little over a month left of school, I can say I am almost finished my first year of college. So much has happened here at Loyola. I have created so many memorable experiences, both good and bad. Hopefully when the fall semester begins and I become a sophomore, I will learn from my mistakes from freshman year and do better. Academically, I now know that I must not push my personal limits on how many classes I enroll in per semester. With many classes, it is extremely hard to balance each class out alongside its homework, projects, and quizzes/exams. Also, because I am a commuter, I intend to enroll in classes that do not carry over past 3:30 or 4:00pm. (Currently I have a class that ends at 4:40 and I always find myself exhausted and tired). Besides academics, I must remember to take care of myself. If I am not well, then the outcome of the things I do will not be so good. With that being said, I want to aim for 7-8+ hours of sleep per day, a good, full breakfast, have some time for relaxing, and some time to socialize. If I accomplish these things, I know my mind and body will be in the right place and I will be able to be more active and productive towards myself and society. I believe that by now everyone accepts and understands my fitness posts. (Yes, you guessed it – here’s another one). However, in this blog post, I want to talk about a topic that I had not heard about before. I was so confused because I was so used to her talking about “Booty Lift,” “Turbo Kick,” “Beachbody,” “21 Day Fix,” “Shakeology,” etc. So, I shot her a text and asked her what it was. I was very interested when I found out, so I had to Google it! What intrigued me the most was the motto: “CHAARG has been liberating girls from the elliptical since 2012.” I knew that these girls had the same mind set as I did! I am all for #lifting, #girlswholift, #swolenation (haha), #butreally. Besides the fact that I have lost the most weight by incorporating dumbbells into my workouts, I had to say that this program was so right. I love lifting and doing plyo workouts; I’m a fanatic of intense workouts, but I also love running. However, through out my years at Loyola, I have found out through my peers that there is more to losing weight and being healthy + fit. Weight lifting and alternating workouts ASIDE from the elliptical will get you ultimate results. Besides, you will feel strong. REALLY STRONG. Mary is working on starting a chapter at Loyola University! This is so exciting because this movement has just started and is active in 17 universities in the U.S. , let’s make it 18!? I enjoy talking about this because I love living a healthy lifestyle. I do binge on certain occasions and some of my friends follow the 80 and 20 diet. 80% healthy foods and 20% of whatever they want. So, if this is motivating then my purpose for this post is fulfilled. You know you’re body and you have your own definition of fun, but most importantly what will work for your body. CHAARG is just that. Check it out! This weekend I had the wonderful experience of helping out at this year’s Loyola Weekend! It was a fantastic time, meeting all the new admitted undergraduate students! Some of the most frequently asked questions of the weekend were some of those that seemed the simplest to me, and so I thought it’d be a good idea to share them. 1. Where are you from? (Nebraska.) Oh, my student is from (insert city here) and I’m worried about the distance. How did you adjust? Honestly, coming to Loyola and getting acclimated was as easy as it probably could be, considering the 500 mile difference and knowing no one. There are tons, and I mean TONS, of opportunities for you to meet other students here. Your first week of school is also welcome week, a week devoted to getting adjusted to the school and getting you involved with your peers and surrounding community. Additionally, there is a class mandatory for all freshman to take, called UNIV 101, that will greatly help you adjust to college and you can meet your academic advisor, who will answer any questions you have. 2. What is there to do on the weekends? What does a typical Friday or Saturday night look like for you? As much as I would have liked to answer with some super fun and exciting response, realistically I use my weekends to wind down from a long week of studying and tests. If you’re not planning on binge watching Netflix and hiding from everyone, there is a ton of things for you to do. Your ID gets you a TON of advantages around the city, some of the most popular being free access to the Art Institute of Chicago, discounts at a ridiculously good amount of food places, as well as access a lot of other museums and activities. If you’re not into museums, there is a lot of advantages of living in Chicago–there is always something going on. 3. What is it like to live in a residence hall? This question always made me chuckle. I’d never really thought of it, to me it was just another place to study, eat, and sleep. However, I’ve really enjoyed living in a residence hall this year. It’s a fantastic way to meet fellow students and connect with people, some of my best friends live on my floor. There are lounges where you can cook, watch TV, or play pool, there are certain quiet hours, as well as 24 hour courtesy hours. It’s comfortable, and the rooms here at Loyola are not cramped in any sort of way. I’ve never felt like I’m in a small box and have no room. 4. (My student) is deciding between here and (insert other colleges names here). What made you decide Loyola? I feel like a broken record saying this, but the thing that made me choose Loyola is the never-ending kindness of the staff and students. It is a scary thing to come to a school where you don’t know anyone, and even if you do know people, college is scary in general. The fact that I genuinely felt welcome at Loyola, regardless of racial/religious background, personal beliefs, or even being from 500 miles away made me say yes to Loyola. The fact that this kindness and accepting attitude is something that I have continued to see after committing and attending here confirms that I made the right choice. Loyola may not be right for everyone, but it sure is right for me. 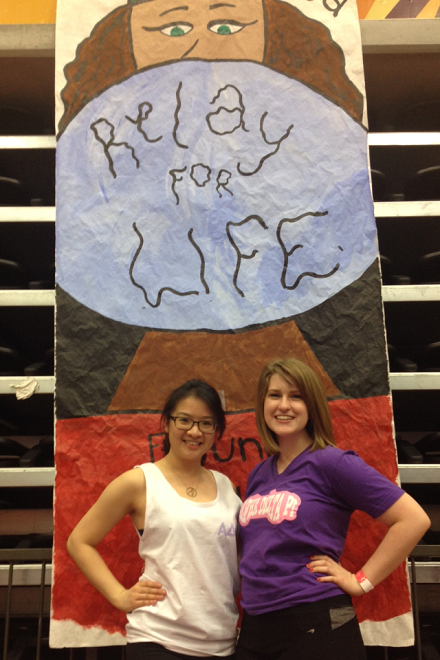 The very first lap of Relay was the Survivor’s Lap. One of my Alpha Delta Pi sisters is an actual survivor. Hearing her share her story on stage reminded us of the good cause we were supporting. This year’s Relay for Life theme was Carnival, so the themed laps were “purple,” “birthday,” “circus performers,” “circus animals,” and several other celebration themes. My team won the purple themed lap, which required us to walk one lap around the arena wearing as much purple clothing and accessory items as possible. My favorite activity was the Mr. Relay pageant, where each team chose one man to dress up like a woman then compete to raise money for his respective team. There was a question and answer component, a talent component, and a fundraising component. It was hilariously entertaining to watch and was definitely one of the evening’s highlights. I feel extremely blessed to not have any family members or friends have their life changed by cancer. However, I know that many people have, that’s why I, and many others, choose to relay for those who have fought and are still fighting. This week, the John Felice Rome Center focused on “joining hands for a world of peace, liberty, social justice, and moral value”. And I don’t think there could’ve been a better theme for the week as spring sets in and we all look towards a season of new beginnings (and warm weather of course). Inter Religious week’s festivities began with a guest lecture by Dr. Janis Fine on the importance of interfaith dialogue. Dr. Fine traveled all the way from Chicago to Rome to lead several events throughout the week. On Monday evening the Student Activities Committee organized a Silent Auction for goods and services provided by students and staff of the JFRC. All of the proceeds from the auction went to support the Jesuit Refugee Services and Relay for Life. The most popular items of the night included a variety of baked goods, a private tour of the Vatican Gardens, and because our campus raised over 1,000 euros Student Life Assistant Mitch had to shave his head… and his beard. Tuesday evening an Interfaith Dialogue was led by women of the Catholic, Muslim, Buddhist, and Jewish faiths. The dialogue centered on the role women play in each of these religions and was followed by an interfaith prayer service. Wednesday morning a group of students was able to tour the only mosque in Rome, which allowed them a deeper look into the Islamic faith. On Thursday evening Dr. Fine led the students once again in a traditional Passover Seder and Festive meal. Students learned the history of Jewish slavery to freedom while they shared this symbolic meal and reflected on themes of freedom and the blessing of abundance as they see it in their lives. One of the most exciting opportunities Inter Religious week offers is the Friday day trip to the Jewish Ghetto and Synagogue. Unfortunately, I personally did not attend, but I’ve heard nothing but high praises from those who went. Dr. Fine led the trip which began with historical readings about Jewish suppression along the banks of the Tiber River. The group was then able to tour the Jewish synagogue and a museum as they dove deeper into the practice of Judaism. One big highlight of the day was the Kosher lunch they shared together in the Jewish Ghetto, which my friends said was absolutely incredible. Although I was unable to attend all the events this week had to offer, I think it was successful in conveying messages of cooperation and peace among those who may hold different beliefs than us. And I definitely think that this message is especially important for all of us studying abroad. As we travel from country to country this semester and experience a multitude of different cultures a willingness to learn about and respect other peoples is of utmost importance. One major thing students must learn about living on their own in college is how to buy their own groceries! Throughout many people’s lives (including my own) up to college, parents often bought groceries and snacks for us and we never really had to worry about it! Now that we are in college, however, it is up to us to buy our own groceries if we so desire. In this post, I will be discussing places around campus to easily purchase groceries! My favorite place to purchase groceries is Trader Joes. Although there is not a Trader Joes directly within Rogers Park, there is one just off of the Dempster stop of the purple line! Students can easily access it by taking the red line to Howard, transferring to the purple line, and exiting at Dempster. The Trader Joes is only a few blocks from the stop! There is also a Trader Joes downtown, but it is much farther to carry bags back to campus from downtown. However, it could come in handy if you’re down there already! Other popular places to buy groceries around campus (as many Chicagoans know) are Jewel-Osco and Mariano’s! There is a Jewel just off of the Berwyn stop of the red line! It’s only a few stops away, so carrying bags back is not a huge hassle. There is also a Mariano’s that is easily accessible by the 147 bus. Students can board the bus on campus, ride it for only a few stops, and get off right across from the Mariano’s! I love shopping there, and travelling to it is not hard at all! Some other places to buy groceries include Target off of the Wilson stop of the red line (also one downtown), Whole Foods, and smaller places such as CVS or Walgreens. When buying groceries, I would recommend bringing your own bags, as it would be easier for you to transfer back to campus! Also for this reason, try to only buy what you need for the next week, so you don’t have to carry a million bags back on public transportation! All in all, grocery shopping around Loyola is not difficult and is easily accessible. Since many of the stores are only accessible via public transportation, I recommend not going alone at night, as it could be dangerous and your guard could be let down due to the bags. But, shopping alone during the day or with friends is always a good idea, and can even be a fun activity! I know I love shopping for myself now that I’m in college and not having to rely on my parents for food. So, if you find yourself needing groceries or snacks, don’t worry! There are plenty of options out there and now you know where to find them! Scope out these awesome Classes Loyola Offers! Hello Hello Hello! It is almost Friday, which means it is almost the weekend! Who does not look forward to the weekend! Thinking ahead to the weekend and beyond these past couple days made me think about the past a little bit too. When I was talking to my friend today, we were reflecting on the past that we have had at Loyola. It is so weird to think that only about a month more and I will be graduating! Life is getting way too real, way too fast. Anyways, we were talking about life at Loyola and some of our favorite classes. Which of course I wanted to share with you guys! Who does not want to take more interesting and exciting classes??? The Writing of Fiction (ENGL 318) – We got to write short stories! If you are thinking that you would not be interested in creative writing and that maybe this is not the class for you, hold up, this class is the bomb for EVERYONE! It is so much fun and there is literally no bad writer! It is a relaxing class where you are allowed to be creative and to express your own weird ideas whatever they may be. Bonus: you are also never wrong, because nothing is wrong in your own story. Piano (MUSC 102) – Do you want to learn an instrument? Have you ever dreamed of becoming a famous musician who tours the world? Then this is a great class to get started on that dream. Yes, you will not come out as a Bach prodigy, but you will learn the basics of how to play the piano and more importantly, you will have fun doing it. Animal Behavior (BIOL 320) – This is a science class, but an interesting science class. It is literally what it says it is, animal behavior. You learn everything there is to know about animals and how they grow, learn, and interact with themselves and others who are not the same as them. The class is just so chalked full with interesting information you really won’t notice the long class period. Spanish 2 (SPAN 102) – It is always interesting to learn a new language! I am not gifted in learning them, but this class was super fun because the teacher was very patient and understanding with her students. She wanted us to succeed. We even took a field trip to the National Museum of Mexican Art and had a Day of the Dead celebration which included Spanish Bingo and tamales. Overall, it was just a great class with a great atmosphere to be in. Environmental Sustainability (ENVS 283) – In this class we learned all about the environment, its deterioration, and what we can do to help. We had to do some volunteering for this class so two of my friends and I did gully walking. We went along the Chicago River and looked for gullies with a guide so that we can report them to get fixed. These gullies are cracks that lead outwards from the river and here the soil deteriorates and erosion occurs. It was fun to get out there and help the environment. Evolution of Western Idea till 17th Century (HIST 101) – This was a history class and for someone who dislikes history, this class made me appreciate it. We covered mostly ancient history including the Romans and Greeks and I just loved this class! The professor was probably the best professor I ever had. He cared about his students. He was always more than willing to help, made his exams challenging, but more than doable, and kept class interesting with funny jokes and powerpoint slides. John McManamon was the professor’s name, and he has to be the best professor at Loyola! So if you are not graduating, you should check these classes out! I guarantee that all of them will be interesting and will make you not dread going to class every day. Today, we’re going to have a talk about how to take 18 credits a semester and not feel overloaded with work. This semester, I decided to take 18 credit hours in order to be able to take all of the classes I wanted and complete the major and minors I want to. It’s not an awful class load, only 6 classes, but it’s a lot of commitment. You have to really want to take these hours. This week, for the first time all semester (so it’s taken a while for it to be like this), I had 5 tests in 5 days. While I could have probably figured this out and probably excelled at this in high school, I wasn’t so sure about college. The curriculum is harder, more difficult, and advanced. So what do you do when you’re completely stressed out about 5 tests? With careful studying hours, a day-to-day schedule, and about 200 flashcards, I got it figured out. While that doesn’t sound remotely appealing, and I know it, it’s what got me through this week. This has also been the first time that it’s happened all semester, so realistically it could have been much worse. So just know, that even the bad weeks are easy to get through if you put your mind to it and don’t leave it piling up. Last Friday, March 20, marked the first day of Spring 2015, however, that didn’t stop Chicago from snowing just three days later. With fewer than six weeks of classes remaining until Loyola officially starts summer, it is hard to stay focused when all you can do is stare at the pile of snow outside while wishing for warmer weather and daydreaming about a beach vacation. Sometimes, a late night run to the Sprinkles Cupcake ATM, near the Water Tower Campus, is all that’s needed for a boost of motivation, but, at other times, like when the calendar says “spring” but Mother Nature rebelliously delivers “temperatures below freezing,” even pink butter-cream frosting can’t beat the persistent winter blues. To keep myself on track and to make sure that I finish out my first year of college strong and worthy of a pat on the back, I am making myself an inspiration board. An inspiration or vision board is a collection of words, quotes, and pictures that represent a goal or a visual representation of the things that motivate you. If you want to run a race or a marathon, the board can be a training schedule with encouraging phrases and photos. If you are like me, and strive for a healthy, less stressful lifestyle while maintaining a good academic standing, then your board can have short dorm-friendly workout circuit routines, some motivational quotes, and some phrases encouraging you to try new things and being courageous. An inspiration board can be as simple as a bulletin board or a small canvas board. It can even be a single motivational quote, written on a post-it note and stuck on the wall. Having a physical reminder, big or small, will help keep you in a good mood and really does help keep you going, even when you don’t want to complete an assignment or just want to catch up on some sleep. 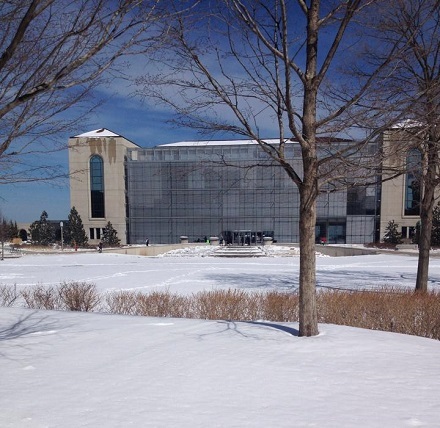 Here on the LUC campus, the spring weather may not have arrived, but the spring semester is almost over. Snow notwithstanding, we’re about to cross the finish line. Do what you must to keep yourself motivated, and don’t give up now!